Dennis Franzen started in the business of commercial illustration in 1985 and has completed works for major U.S. agencies such as Leo Burnett, FCB and J. Walter Thompson. Some of the accounts included projects for Coca-Cola, Miller Brewing, Artline, Oldsmobile, Pillsbury and Pizza Hut. Dennis Franzen's work has been featured on billboards, commercials, in print and in the movie "The Package" with Gene Hackman. His work includes commissioned work for U.S. businesses for the design of custom logos and trademarks. One of Dennis' pieces titled, "America's Hero"
"A Rocket Blasting Off" that aired on March 11th, 2014. 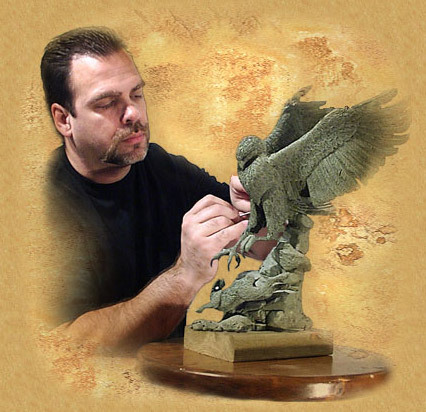 Franzen's sculpting career talent began years ago with pieces made for Roman Inc. who has classified the works as "The Dennis Franzen Collection", and has expanded since with contracts with the "Bradford Exchange" and the Minnesota based "WildWings" for wildlife-themed sculptures. His work ranges from the realistic to the abstract and has several bronze sculptures featured in various art galleries throughout the U.S.
Franzen Ltd. produces world class, original fine art sculptures, figurines, collectibles, wall murals, stained glass, mixed media paintings, abstract art, and laser metal art for both home and business. They are sold in both domestic and foreign markets. The company also accepts commission work for public and private businesses and institutions.